As from early October last year the Safeway motion compensated offshore access system of the Dutch Van Aalst Group is installed on the 95-metre long OCV ‘Olympic Intervention IV’, owned by Olympic Subsea ASA, Norway. Without any significant downtime, the 28 m long walk-to-work Seagull-type has safely transferred workers and their tools at a high pace from the ‘Olympic Intervention IV’ to offshore wind turbines of Adwen, part of Siemens. “Our gangway in combination with the ‘Olympic Intervention IV’ proved to reach new record speeds in transferring people and cargo. Last year Siemens gave us a challenging benchmark for this vessel/gangway combination; from sail away to turbine, DP positioning, deploy and transfer 6 people and 3 cargo loads, return in sailing position within 30 minutes. We, together with Olympic are very proud of this achievement, proving a realistic base for preparing offshore operations. This will contribute to the overall industry costs savings, lowering installation and maintenance costs of offshore windfarms”, said Remko de Boer, General Manager at Safeway. 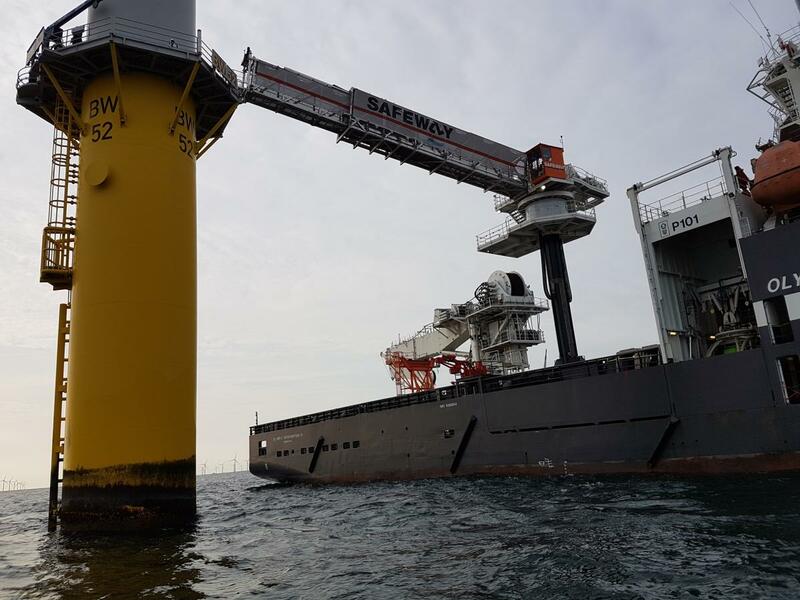 The transfer operations proved an remarkable score in reducing costs where Safeway could reach positions on Borkum-West and Wikinger windfarm without any modifications to the gangway or pedestal. This is due to the standard 10 m vertical height adjustment of the gangway.